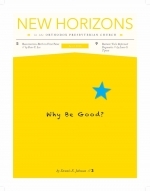 April, 2018: Why Be Good? Five centuries ago, the Protestant Reformers confronted a pastoral challenge that is still with us today. Actually, the same challenge confronted the Apostle Paul in the first century. As the Preacher said, “There is nothing new under the sun” (Eccl. 1:9). The resurrection of our blessed Savior gives us extraordinary hope of eternal life and a “joy unspeakable” as we suffer through the trials of this fallen world and face the final enemy of death. However, what we may not realize is that his resurrection also helps us to understand the nature of our salvation.